We’re making a new resource available to Panoply customers and users. We call it our Community, and one click over there and you’ll see it is a forum. 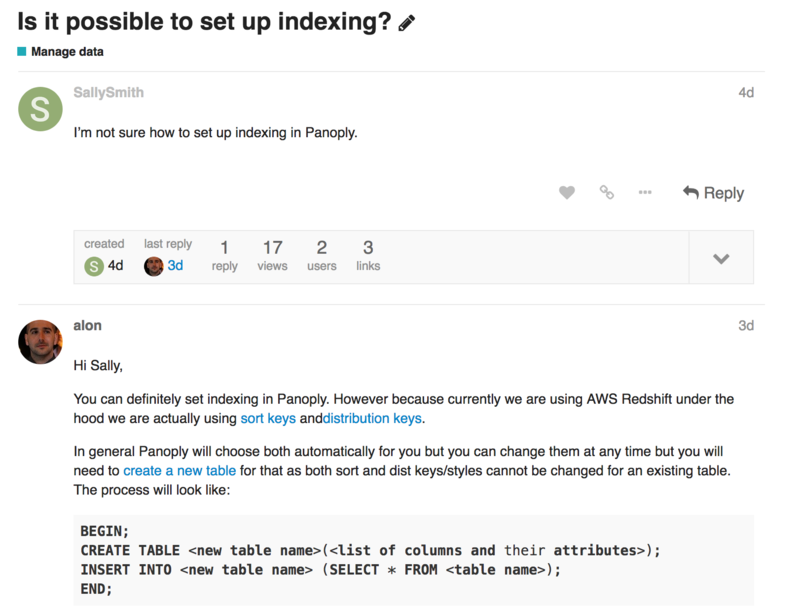 To break down the elements of using Panoply - the Community exists for all to ask questions, give answers, share best practices and showcase wins in using Panoply. It’s the best place online to interact with Panoply employees and your fellow Panoply users. Of course you can still reach us via email, on Twitter, LinkedIn and Facebook, but our Community offers a way to ask questions in a Panoply-first environment. Consider it the ‘Commons’ (for those of us who miss university) where Panoply power-users, employees and newbies all get to hang out together and talk shop. The Community offers a place to have large, ongoing discussions that will garner input from a lot of people. To facilitate the different sections of the community to be tailored for the type of information you want, we’ve assigned categories as containers for topics. Introduce yourself: Please go here first and let everyone know a little about yourself and your work life! Announcements: this is where we’ll post updates, changes and additions to the platform. Our most active tag in this category is Changelog - see new data sources and capabilities within the Panoply platform. Show and Tell: Come to Show and Tell to show off your best insight, data visualization, query or whatever - we want to see what you’ve been working on! 😀 Bonus points if you’d like for us to share this more broadly in other channels -- we love shining a light on awesome data-driven projects across all industries from contributors, no matter who you are! Collect Data: 🎣 Head here to pose questions focused on collecting data into Panoply and our data integrations. Manage Data: 🤠This is the place for questions focused on transforming data and managing your data warehouse. Analyze Data: 📊Go here to discuss topics that are all about data analysis. Whether it’s correlation, data visualization or something else - post it up! Open Q and A: this is the category for questions that don't fall into any of the above categories. For the first 15 people who sign up for the forum and introduce themselves, we’ll gladly send you a swag pack from Panoply. Go ahead and get started...we’ll spot your post and we’ll be in touch.